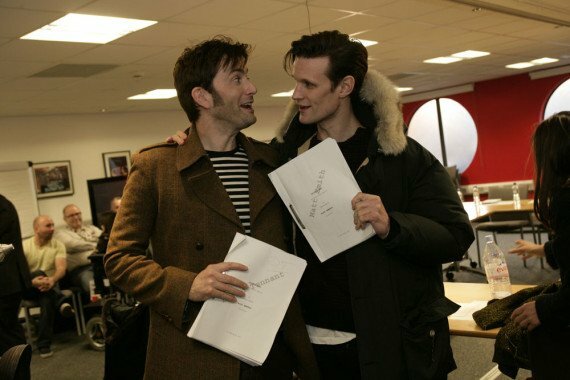 The 50th anniversary of Doctor Who is still another seven months away, but fans have more than enough reason to get excited already as David Tennant and Matt Smith were together at the readthrough this past weekend. Seeing the actors together is bound to get any fan giddy and I can’t even imagine what it will be like to see them together as the Doctors with their own costumes and sonic screwdrivers and everything. It’s only a matter of months now, folks. The big question here is, who else is in the room? Tom Baker perhaps? Or maybe Paul McGann? For all we know Chris Eccleston could be taking the picture. Whatever the case, I’m sure all will be revealed soon as filming started this week. 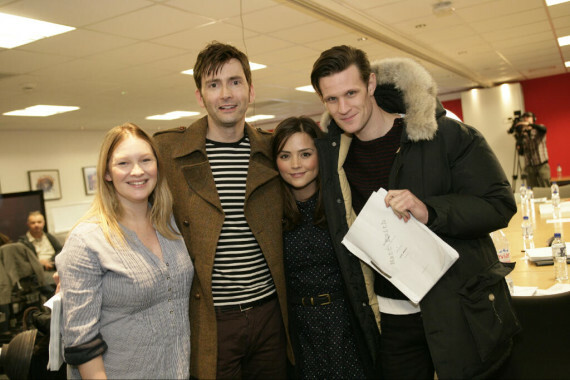 From the group picture below with Jenna-Louise Coleman and the two Doctors, a new addition to the cast has also been confirmed as actress Joanna Page will be guest-starring. You may know her from the British sitcom, Gavin & Stacy. There’s no sign of Billie Piper or John Hurt here, but I’m sure they’re around. 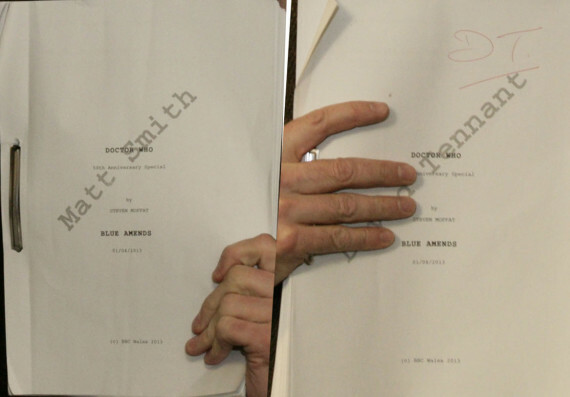 There’s also a close up picture of both Tennant and Smith’s scripts. It should be noted that “Blue Amends” is most likely not the title of the episode special, but rather just a working title for the time being. 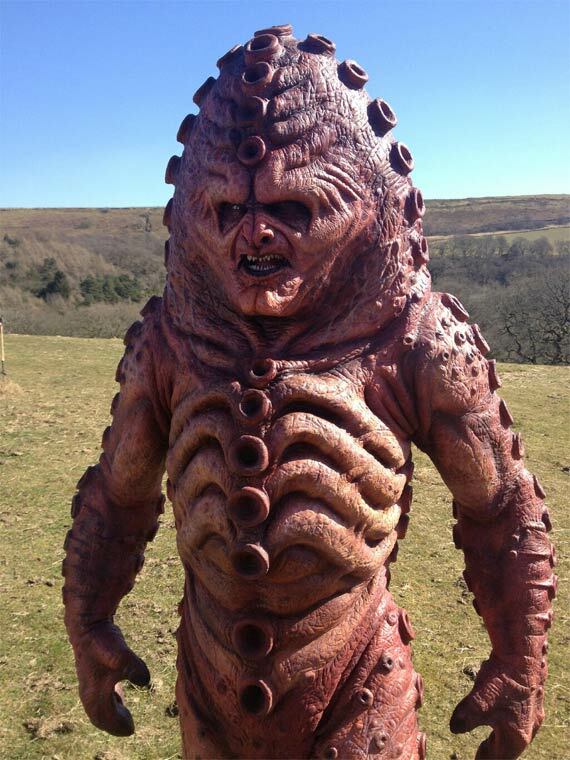 As filming began this week, a picture of a Zygon was released (see below), confirming them as a villain for the episode special, if not the main villain. While mentioned a couple of times, they’ve only been on-screen in one story from the Fourth Doctor era, “Terror of the Zygons”. The Zygons are known to be David Tennant’s favorite monster. They can shape-shift to any human form and I wonder if that’s how we may see past Doctors rather than getting the actual Doctors together. The Zygons are another batch of returning classic Doctor Who monsters this year as we’ve already seen The Great Intelligence, and are about to see the Ice Warriors, return in the second half of Series 7. It’s clear that the series will be done justice come the 50th anniversary as the history of the show is not forgotten. You can expect more news from the anniversary special in the coming weeks, and hopefully find out that former Doctors beyond David Tennant and his iconic sideburns are returning. The Doctor Who 50th anniversary special is set to have a limited 3D cinema release worldwide on November 23, 2013. Is there any other monster you hope to see in the special? Let us know in the comments.